I tinkered with this simple syrup while visiting Los Angeles last month. Emily and I infused vinegar with peaches, and the flavor notes in this syrup sounded like a divine accompaniment to our peach vinegar, a la shrub! I like how versatile it is, how you can add a tablespoon or two to a glass of cold water or seltzer water (or Cava) for a homemade soda/instant libation. Add whiskey, gin, or vodka to your soda and you have a cocktail. Fun for the whole family. 1. Zest one of your lemons before juicing it (it’s easier). Juice lemons and strain pulp from juice. Measure the volume, adding juice if needed to reach 1 cup. 2. Dissolve sugar in water, bring to a boil where bubbles are about the size of a dime and then remove from heat. 3. Add lemon juice to the sugar syrup and bring it back to a boil. Remove from heat and let cool. Pour into a pint jar to allow to cool on the countertop. 4. Once jar has cooled considerably, warm is okay, but not piping hot, add zest and allspice directly to syrup jar. 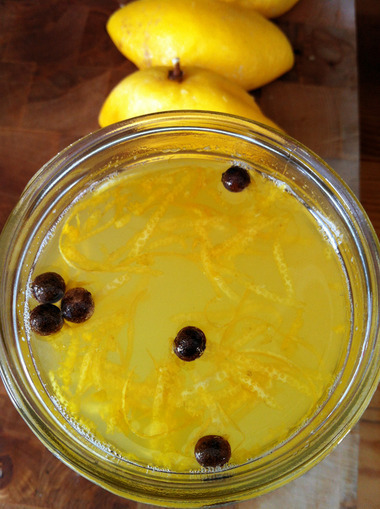 Cap jar and allow it to infuse in the fridge overnight or for up to 3 days. Strain syrup and enjoy in a soda, cocktail or added to a shrub infusion! Will keep in the fridge for about 2 weeks. Hint: Freeze in an ice cube tray and add a cube or two to a cocktail or iced tea later in the summer.